Do you have an abundance of t-shirts piled high in your closet? Perhaps they are your high school or college shirts you just can’t seem to part ways with, maybe (like me) you have shirts spanning decades from concerts you’ve attended, or maybe you are a runner and have shirts from races you’ve completed? Regardless of the reason, if you are not wearing the shirts, but you can’t seem to cut ties, why not cut them up and sew them back together? 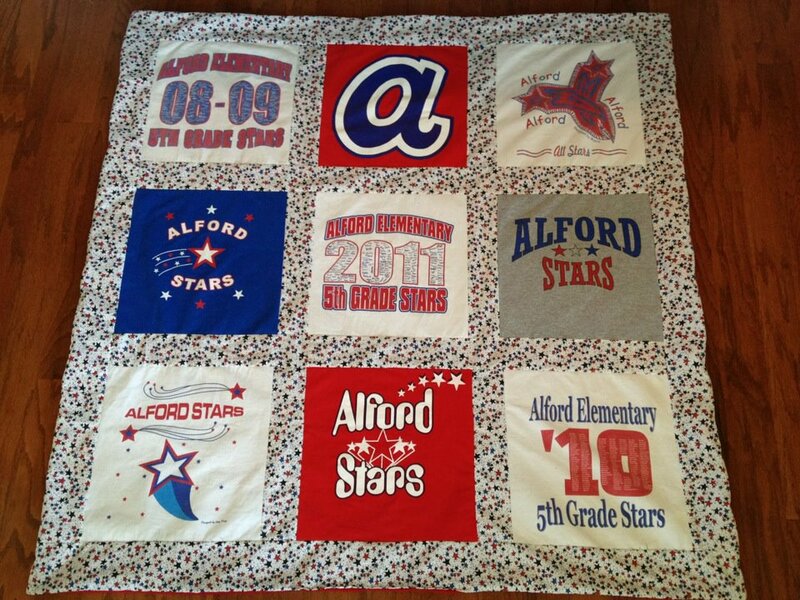 T-shirt quilts are the perfect way to preserve your memories. 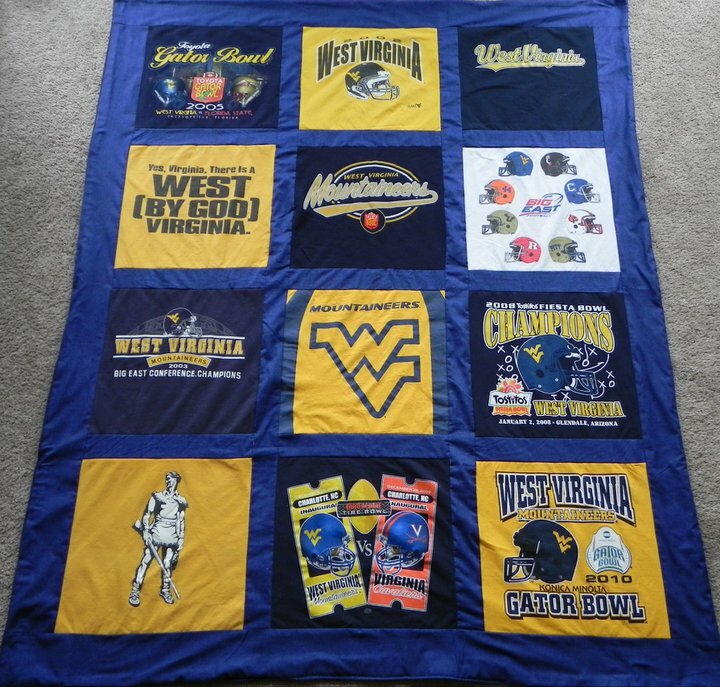 I created my first t-shirt quilt in 2005 using my high school t-shirts. 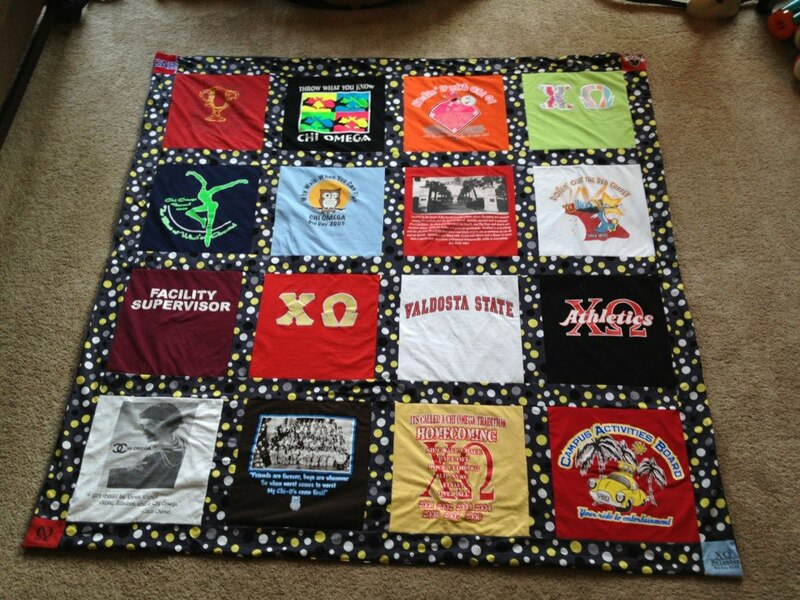 I then created a quilt for my sister, then one with my college shirts. It wasn’t long before I was making quilts for friends, and then friends of friends. To this day, it is one of my favorite things to create because I am able to take something with meaning that isn’t being used, and make it new again. My quilts vary in size, but traditionally they use 9, 12, 16, or 20 shirts. 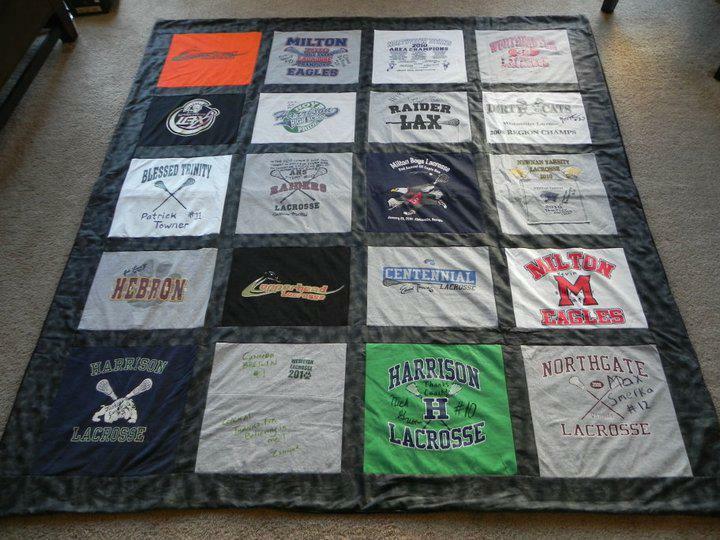 For the majority of adult quilts, t-shirts are cut into 15″ squares with 2.5″ of sashing between them, and a 4″ border. All quilts are backed with anti-pill fleece, making the backs just as soft as your treasured shirts. Below, are answers to frequently asked questions. Please feel free to contact me with any questions. I’d love to help make your old t-shirts into a lasting memory. I charge $12.50 a shirt, making a quilt with 9 shirts $112.50, a quilt with 12 shirts $150, 16 shirts is $200 and 20 shirts is $250. I am able to embroider a name or date on a square or on the back for an additional charge. If you’d like pockets incorporated either as corners or as a block on the quilt, that is $5 each. For quilts using infant or children’s clothing, prices start at $7 per shirt. I require a 50% deposit upfront, and the remaining balance when your quilt is finished. I accept cash, check, and credit card payments through PayPal. Checks can be made payable to Melissa Harper. How do you get the shirts? I live just outside Atlanta. If you are local, I’d be happy to meet you somewhere, swing by your house, or you can come to me. If you are not local, you are responsible for shipping shirts to me and for paying shipping for me to send the completed quilt. When we talk, I’ll ask you a few questions about color and style. Usually, I order fabric online, and that allows me to send you pictures of fabric samples to chose from. What size is a finished quilt? 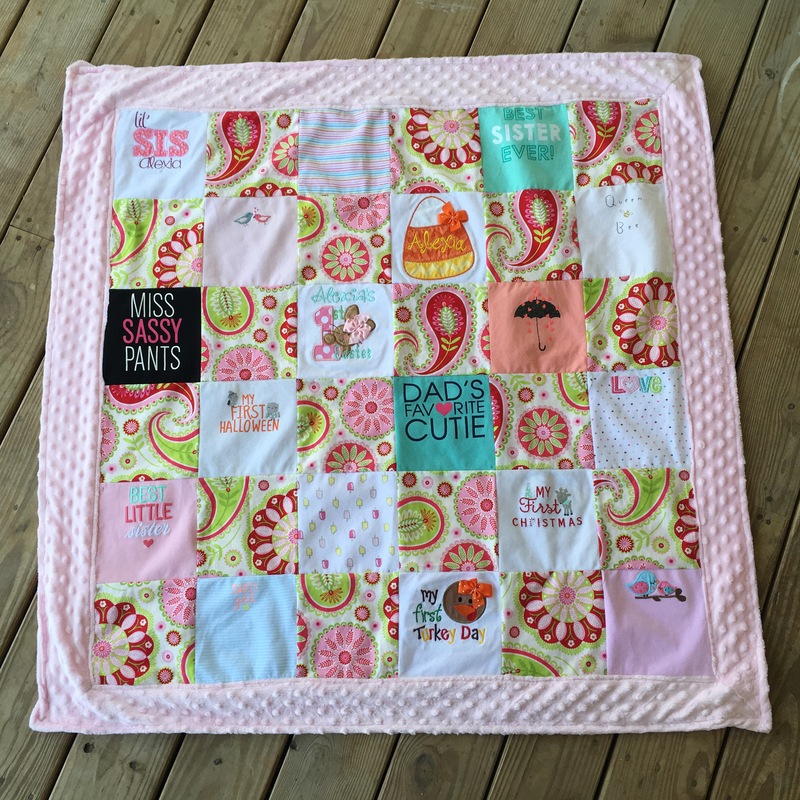 Keep in mind, I can only make the quilt squares as large as your smallest shirt, but traditionally, a quilt with 9 shirts is 60″ square, a quilt with 12 shirts is 60″ by 75″, and a quilt with 16 shirts is 75″ square. Yes! I advise washing quilts on a cold, gentle cycle, and drying on low heat. Usually, quilts are complete in 2-3 weeks. Spring graduation and Christmas are extremely busy. 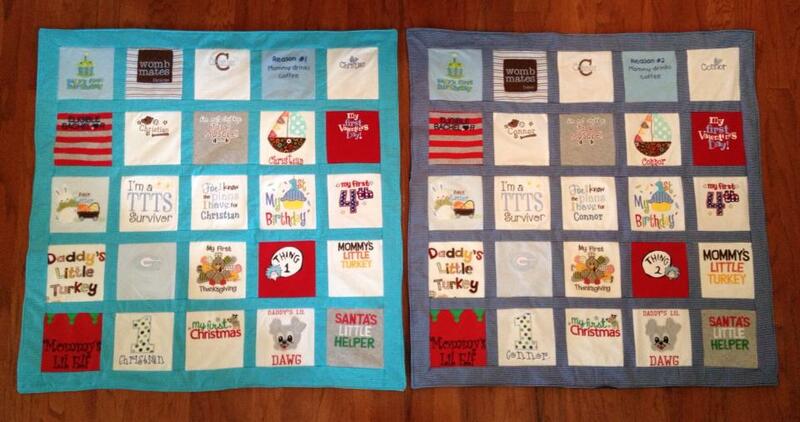 This past Christmas, I had 5 quilts that I did between Thanksgiving and Christmas day. Plan ahead, and the earlier you can get me your shirts, the better. I won’t accept your order if I can’t fulfill it in time. 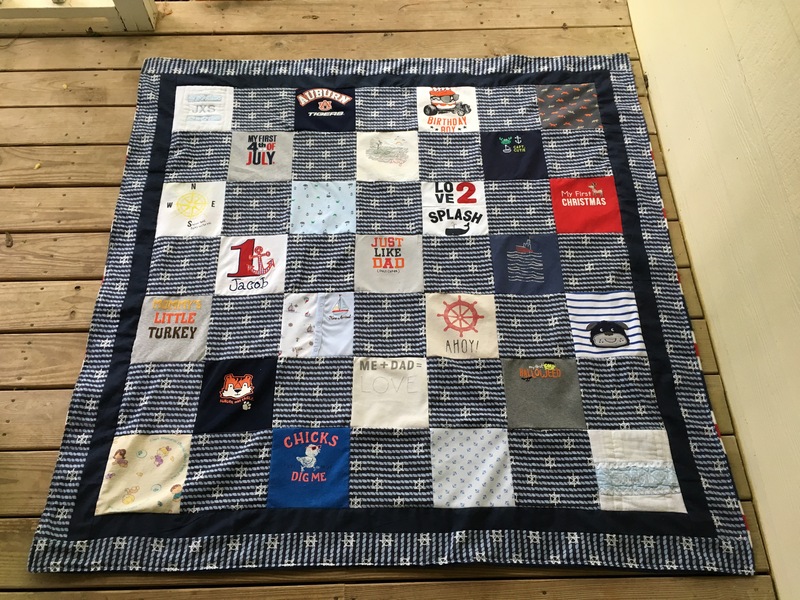 Why do you not have t-shirt quilts listed in your easy shop? I like the opportunity to talk with people, either face-to-face, or over the phone regarding their quilt. Prices vary depending on size and add-ons too. So, having a listing through Etsy makes that process difficult. For the time being, I market this service through my blog and Facebook, but my best advertisement is referrals. All of my quilts are sewn with love in our smoke free, dog friendly home.